Roman Catholic Bishop Fred Henry of Calgary and Edmonton Archbishop Richard Smith have both filed attestation affadavits with the Vatican in Rome declaring that they witnessed a miracle on May 5, 2015 when the New Democratic Party and party leader Rachel Notley won a landslide victory in the Alberta, Canada provincial election. 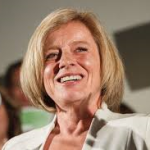 For the first time in the history of the 110-year old oil patch and tar sands province, social democrats were elected to form a majority government, winning 53 of 86 seats. 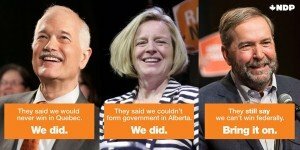 The “Notley Crue,” as it was known on orange T-shirts (recalling an ancient rock band, the Motley Crue), defeated former Conservative Premier Jim Prentice, and reduced the long-governing Tory caucus to 10 seats. The Tories finished in third place behind the Official Opposition right-wing Wild Rose Party. Prentice immediately resigned as party leader and Alberta MLA. The election ended a streak of 12 Conservative election victories and almost 44 years of uninterrupted rule. 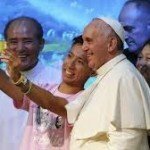 The Catholic Church, who as recently as Dec. 2014 was supporting then-Premier Prentice’s bill designed to curb the rights of “gay-straight alliance” groups at Alberta schools, was apparently visited by the Church’s so-called Holy Ghost on election eve and experienced what is being described by church deacons and teenage altar boys as a “conversion event.” The suspended bill, which could have forced gay-straight alliance meetings off school property if local school boards objected to their presence, has now been retired to the Edmonton Museum of the Inquisition, located right next door to the province’s second largest Natural History Dinosaur Museum. 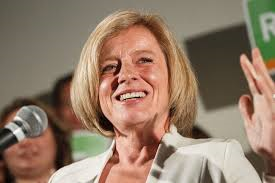 The Pope further declared that he would put Rachel Notley’s name forward for beatification on the road to sainthood, just as soon as he cleaned up the last details of the canonization of St. Jack Layton, set for later this summer when the Pope visits Toronto and blesses the Etobicoke Rehab Centre where former Toronto Mayor Rob Ford first saw the light. Jack Layton, Rachel Notley, Tom Mulcair. 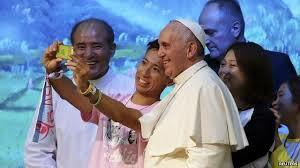 When asked if it wasn’t Roman Catholic standard operating procedure (SOP) to wait until prospective saints had passed over to the heavenly side of things before sainting them, the Pope replied, “If St. Rachel wants to be a living saint, who am I, a poor sinner, to object?” When pressed for timing details, the techno-savvy Holy Father assured the stone-casting press scrum that the sainting was definitely “in the pipeline, now that the bitumen is out of the pipe.” In nomine Patris et Filii et Spiritus Sancti et Charlie Hebdo.